Just realized I never shared my series of black and cream cards that I made months ago for an Odd Bird Planet project. I've seen this Crate cardstock, used on my card, on other's blogs for months and I finally purchased a package after it went on sale. I adore Crate paper but that batch has to be one of my favorites. Even though the entire pack is black and cream all the pages have a aged worn feel to them and they have such a rich look. Love them!! 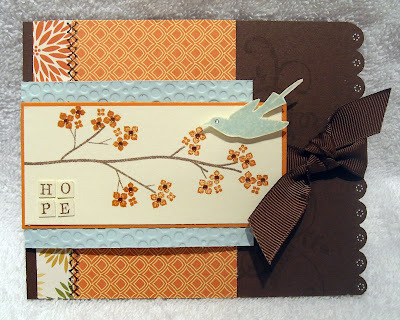 This card was created with the Crate paper and Odd Bird Planet images (flower and sentiment). 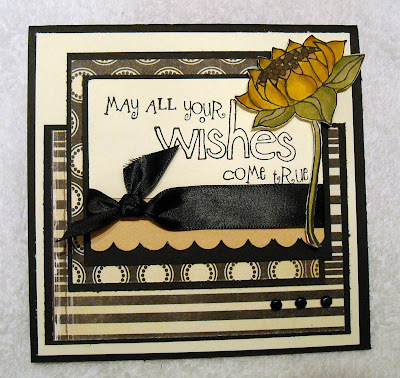 The brads and plain black paper are from Stampin' Up! Ribbon is a random ribbon that I picked up from a scrapbook store ages ago. Wishing everyone a very blessed New Year! I'm not sure if anyone has heard of this issue yet, it just came to my attention about a week ago and I've just found a button to add to my blog to help raise awareness. In a nutshell, the US government in an "effort" to protect children from dangerous chemicals in toys, such as lead, will begin over regulating all toy manufacturing in Feb. of 2009. (This is all under the guise of the Consumer Products Safety Improvement Act) This means that anyone who sells handmade toys will now have to pay up to $300 per item for the government to test their products to ensure that their already chemical-free products are actually chemical-free. Most small toy manufacturers, think just about anyone who sells on Etsy.com, will have to close shop due to a lack of money to pay for the testing. This will also affect small toy manufacturers as they don't make enough money to afford the testing. Failure to submit ones products to this testing could result in fines or perhaps even jail time or a forced closing of one's business as one would be breaking the law. Follow the link on the right side of my blog to find out more info and how to get involved. It only takes a few minutes to send a letter or email to your local congress person and senator. I'm not against making sure the toys we give our kids are safe, however, hindering one's ability to sell homemade toys by introducing an endless slew of needless regulations is yet another stab at the personal freedoms of the American public. Merry Christmas all! I pray that everyone had a blessed Christmas! We had a wonderful day and enjoyed spending time with friends and family. The majority of the materials used on the album are from Stampin' Up! The paper is part of a new series and I just love it! It was perfect to surround photos of a little girl. And I still can't help gushing over SU! rub ons. They glide on so easily you almost don't need to rub. They add such a lovely accent to handmade creations. Foam letters are from American Crafts and small velvet flowers on the first page are from Papertrey Ink. Hope you enjoy and have a delightful and very happy new year!! Just a few more days until Christmas and I have just a few more Christmas goodies to share! In our neck of the woods we have been experiencing snow, snow, and more snow! We had about a foot yesterday, it stopped for a few hours, and we have about another foot today! It's crazy how much snow is outside and we're feeling a bit stir crazy as we've been "locked" in the house for the past two days and are still recovering from the ice storm last week with are friends still without power! However, we are grateful that God has provided us with a warm house, plenty of good food, warm clothes, and power in our home and we have been blessed to enjoy the company of our good friends during the holiday season! 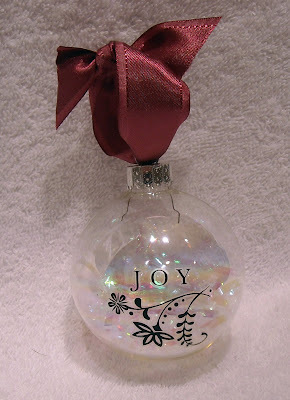 Today I wanted to share a really easy way to dress up plain glass ornaments. I purchased a package of 12 of these glass balls for $6.00 at my local Walmart. 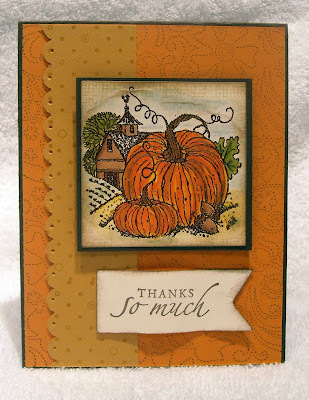 I then used Stampin' Up! rub ons to decorate the front of the ball. I know I've said this before but it's worth repeating...I love rub ons! LOL! I'll have another fun project to share next week using some dark brown ones. They're so much fun and so easy to use...just love them! OK, back to our regularly scheduled program...I then simply added some glittery "stuffing" to the inside of the ball and finished off my custom ornament with a pretty ribbon. This is such a great way to dress up plain ornaments, you could probably use the rub ons on colored glass ornaments as well. A great gift would be to customize an entire package of these for someone and then present them in a beautifully decorated box or bag. Not bad for a $6.00 gift!! Enjoy! "For unto us a Child is born, Unto us a Son is given; and the government will be upon His shoulder. And His name will be called Wonderful, Counselor, Mighty God, Everlasting Father, Prince of Peace. Of the increase of His government and peace there will be no end, upon the throne of David and over His kingdom, to order it and establish it with judgement and justice. From that time forward, even forever, the zeal of the Lord of hosts will perform this." The good news of the birth of Jesus is not only that He came into the world but He suffered and died so that our sins may be forgiven, that we may be free from our overwhelming burdens and that real, deep, and lasting joy can be found. I pray that you and your family may have a blessed Christmas and that Christ will find a home in your heart each and every day! Please visit the SALT blog and if you feel inspired to create something based on this week's theme, please leave a comment with a link back to your blog or gallery. Due to a very bad ice storm in the Northeast I have very limited access to the Internet...yes, it's been two days with no Internet access and I'm starting to hyperventilate! LOL! Thankfully, we are safe and warm in our house and have been blessed to have a generator and the ability to house a number of friends who are still without heat or running water. We anticipate that a few of our friends will be here close to a week before all of the electrical lines have been fixed. It was quite a storm! I will be back to blog posting asap!! I've wanted to participate in one of Kristina's color challenges for ages and this week, thanks to work coming to a screeching holiday halt, I had the time to create something using this week's color scheme. 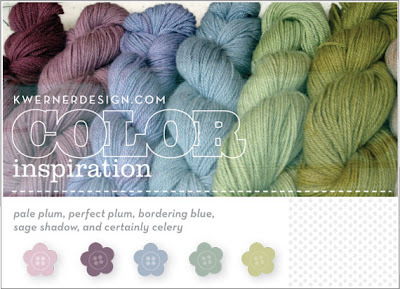 One of the major challenges for me is working with five colors on one project! Whoa nelly - that's a whole lotta color! 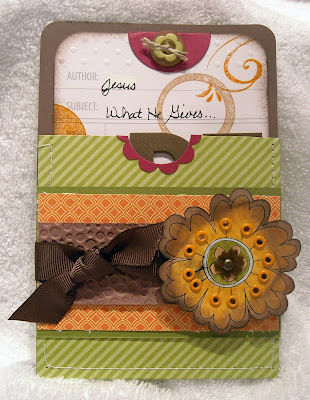 But in the end it worked out....phew...My submission, oh my another scrapbook page, is below. I've also included a few close up photos of some of the elements on the page, like the 3-D clown and tiny metal washer. All of the stamps used on this page are from Stampin' Up!, with the exception of the circle image used on the Certainly Celery strip (kind of hard to see in the photo), that stamp is from Odd Bird Planet. The clown image is from a long ago retired SU! set but I love him and I can't bear to part with him, even if he doesn't see ink very often! He was the perfect companion for the first birthday photo of my little one. After coloring Mr. Clown with Copics, I used my VersaMark pen to color in his shoes, umbrella, nose, pompoms on his shirt, and dots on his hat, and then added some glassy glaze so that only those elements are shiny. This isn't the greatest photo but it's a good view of the hat. I created my own patterned paper, using SU! 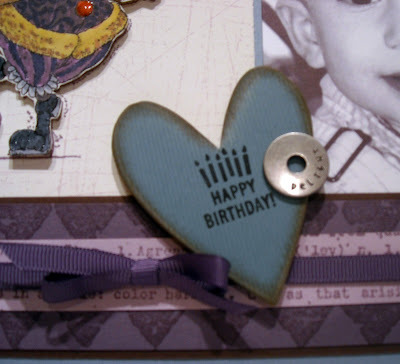 background stamps, on the perfect plum and pale plum strips of cardstock. 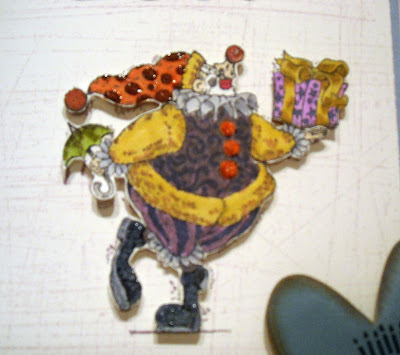 I also used pale plum ink, combined with a "sanded" background stamp to create a subtle background behind the clown. The two silver star brads are also from SU!. Foam numbers, which were white and I colored with a perfect plum marker to make them match, are from American Crafts. (I'd never even know about these fabulous foam numbers and letters if it wasn't for Kristina! She uses them on many projects and I adore them!) The happy birthday stamp is a portion of a new SU! set...just used my marker to color/stamp the area that would fit on the chipboard heart. My biggest challenge was working in the sage shadow...ummm...I never use sage shadow but managed to find one piece of cardstock stashed away in my "I never use these colors" bin. I should note that my entire page is backed by the bordering blue, which is a color I love! Back to sage shadow...I decided to cover the heart in the sage color...makes a nice color contrast to the rest of the page. I found these washers while searching for something else and thought it was a cute addition to the heart. I'm trying to have more fun with embellishments so this was a good start! Can someone please tell me where the past three days have gone?? Goodness, they passed by so quickly I barely realized so much time had passed! I guess it's part of the holiday rush...Today, I thought I'd share a gift that I made for my husband's aunt. 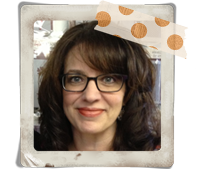 Here I've used Stampin' Up! rub ons to dress up an ordinary glass candle holder. Can I just say that I *heart* rub ons! This little gift cost a total of $5.00! The little candle holders were sold separately and the dish was actually for holding larger candles but the three votive holders fit perfectly on the tray. I filled each holder with some tiny stones and put a candle on top. This would be a great hostess or house warming gift! 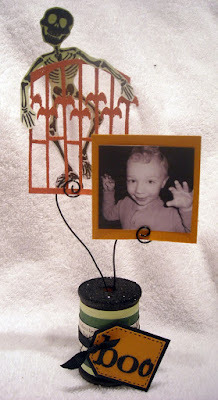 This was such an easy project that I just may make a few of these for my house! I think you could actually use rub ons right on the candle as well...I'll have to try that... 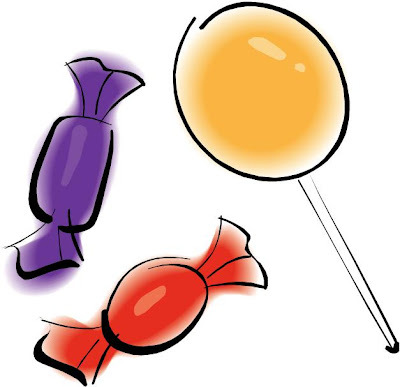 Enjoy and stay tuned for another blog candy drawing, coming up this week! I've wanted to try my hand at creating these cute clipboard message centers for awhile now and along the way I've ended up with about 10 of these mini clipboards that I purchased at Walmart for about a dollar a piece. Since I had these lying around the stamp room, I thought this would be a perfect project for a recent workshop that I held at our house. 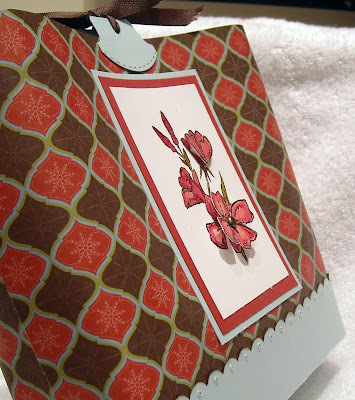 The clipboard was covered in a beautiful holiday paper from Stampin' Up! I used Modge Podge to adhere the paper to the clipboard, which worked like a charm! To separate the two different papers and cover the crease, I wrapped some of the new SU!, and I must say fabulous, felt stitched ribbon around the entire piece, securing it in the back with glue dots. 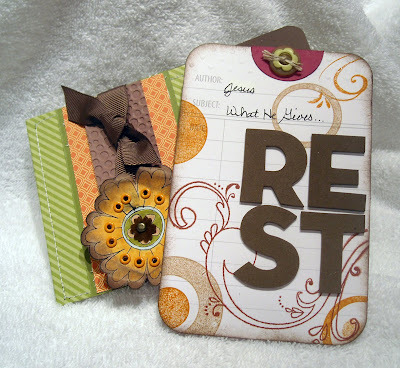 The big letter "S" is grundgeboard from Tim Holtz and has been covered in more of the SU! 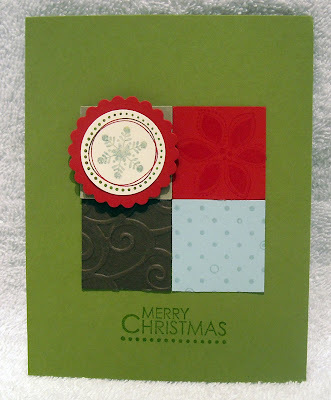 holiday paper and then adhered with dimensional tape. 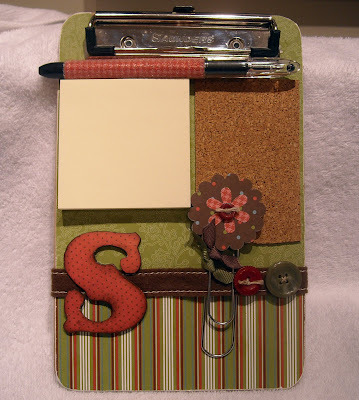 I then added a few button embellishments to finish the clipboard. The post-it note pad and piece of cork were added with glue dots. The paper clip was part of a pack also picked up at Walmart and the top was finished with two flower punches. The last piece was to create the pen. This was the first time I created one of these beaded pens and the affect is just wonderful! They're super easy to make, you can see a tutorial on how to create these pens here. You can click here to order the micro beads needed for the outside of the pens. This was a quick and easy project, add a couple of strong magnets to the back and you've got yourself an adorable message center for the fridge. A great holiday gift for about $5.00!! I'm off to get ready to buy our Christmas tree!! Can't wait for that pine smell floating through the house...one of my favorite parts of the holidays! It's time for another SALT challenge and this week it was brought to us by Kimberly; she chose God is good for our theme. You can read Kimberly's entire write up on the SALT blog. It's sometimes hard to fully comprehend how good God is to all of us. We look around our fallen world, full of hateful people doing hateful things to each other and we are tempted to doubt if there even is a God, forget about whether or not He could be good. However, evil in the world does not equate to no God, rather it equates to the reality of sin and it's affects not just on individuals but on the entire world. God has not turned His back on humanity, rather it has turned it's back on Him and yet, in spite of our coldness of heart and ungratefulness, He continues to bless us with more good than we deserve. If you're reading this, then you are alive and that is darn good news! God is giving you more time on this earth. More time to mend broken relationships, more time to spend with precious children and spouses, more time to help those in need, more time to seek His face while He can be found, more time to sing His praises to those who know Him not, more time to repent of the sins that separate us from Him, more time to learn, to change, and to grow. That is a demonstration of God's goodness, not only to those who call upon His name, but also to those who profess to not even believe that He exists. There is still time... I am exceedingly grateful for God's goodness in sending Christ to die, while I was still a sinner. The great and awesome goodness of God is summed up in that one act. And yet, He has also richly blessed my life with a loving and supportive husband and the most amazing gift of two children. I am daily overwhelmed that He would choose me, a person laden with so many faults, to be a Mom. I will be forever grateful for the blessing of my family... Please stop by the SALT blog to see the other creations made by the team, this week seems to be an exceptional week for us, everything is just beautiful! And feel free to join in on the challenge! Simply post a comment with a link back to your blog or gallery, we'd love to share!! We've added some amazing designers to the Odd Bird Planet design team! Check out my side bar for links and names!! I'm thrilled to be staying on for another term as a designer and the design team manager! What a blast!! I'll start out the month of December by sharing a few holiday stamping ideas. Can anyone believe that Christmas is literally just around the corner! I have purchased one gift...boy, am I going to be busy over the next few weeks! LOL! Today, I'd like to share a few quick Christmas card designs that would be perfect for mass producing. Not that I have ever made my own cards for the holidays! If I did they wouldn't make it into the mail until Easter! However, I have a number of stamping friends that create their own cards each year and for those folks I put together these designs to share during a recent workshop. (BTW - If anyone has an interest in purchasing card kits, complete with stamp set and pre-cut cardstock, feel free to contact me at ksdm@comcast.net for further details) All of these cards were created using the same Stampin' Up! set and coordinating colors. These were such easy designs that I was able to make all three is under a half hour...now that is a "Christmas miracle" as it usually takes me an hour to make one card! ;-) Enjoy and I'll be back this week with more holiday gift giving and decorating ideas! This is the first and only bottle of Primas that I've ever purchased and while I used one or two of the flowers, the rest of the bottle has remained untouched for probably two years in my closet. So...I'm passing them along to someone who will love them as they deserve and put them to good use! 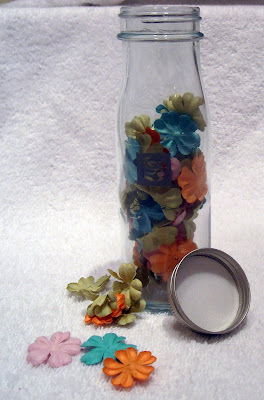 :-) To enter the drawing for the bottle of Primas, leave me a comment with the name of your favorite flower. You must enter by Wednesday, 12/3, at midnight. Enjoy! Cupcake Challenge and Blog Candy Winner! **Blog candy winner info at the end of this post! ** A big package of Odd Bird Planet stamps arrived on my doorstep this week and this gnome stamp has been staring at me from the moment I opened the box...taunting me...just begging to be inked. Since I had some free time this week to create, I decided to participate in Taylor's cupcake challenge, see below, seeing that my cutey gnome would be just perfect for this layout! 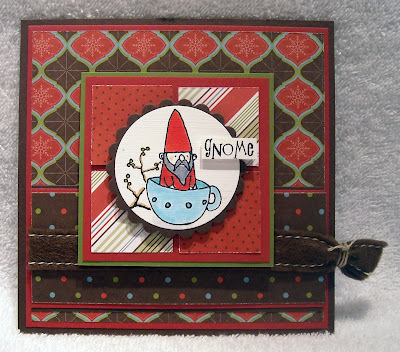 I also used a tiny branch image, also from OBP, behind the gnome to fill out my circle and as my husband said, looking over my shoulder while I asked if the card needed anything else, "a gnome sitting in a cup, on a branch...that's just about all you need!" I needed to add just a tiny "gnome" sign...to remind him of what kind of creature he is. 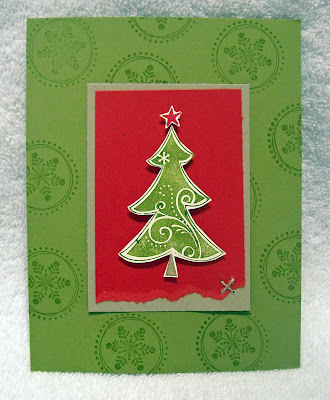 :-) The paper used is from Stampin' Up!, a new holiday print...fantastic patterns! 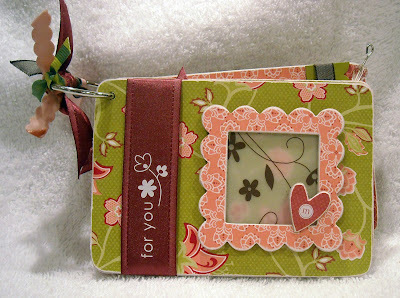 Ribbon, which is a luscious stitched felt, is also from Stampin' Up!. 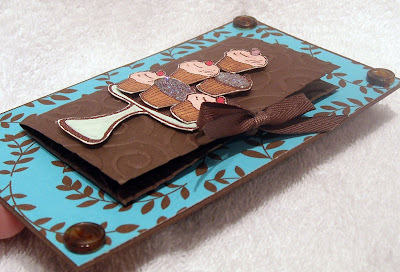 Head on over to Taylor's blog to check out the other creations and why not give this layout a try? Love it! Oh yeah...the blog candy winner! :-) Sorry I took so long to get the winner posted, been away from the computer a bit with the holiday. The winner is....Jules P - Congratulations! Jules, please email me at ksdm@comcast.net with your shipping information and I'll get your package in the mail asap! For those of you who just missed out on entering...don't worry, I'll have another blog candy announcement posted tomorrow! This is a re-post of a card I created last year, using Odd Bird Planet stamps. As you can see from my very quiet blog I've been taking a bit of a break, enjoying my husband being on vacation this week and spending time with the little ones. The Continental Congress issues it's first Thanksgiving Day proclamation for December 18, 1777. The purpose? "That at one time and with one voice,the good people may express the grateful feelings of their hearts, and consecrate themselves to the service of their Divine Benefactor; and that, together with their sincere acknowledgments and offerings, they may join the penitent confession of their manifold sins, whereby they had forfeited every favor; and their humble and earnest supplication that it may please God through the merits of Jesus Christ, mercifully to forgive and blot them out of remembrance; that it may please Him graciously to afford His blessing on the governments of these states respectively, and prosper the public council of the whole." Gives us all something to think about as we consider celebrating a day of thankfulness tomorrow...May God be pleased to grant you a peaceful, healthy, and spiritually prosperous day! 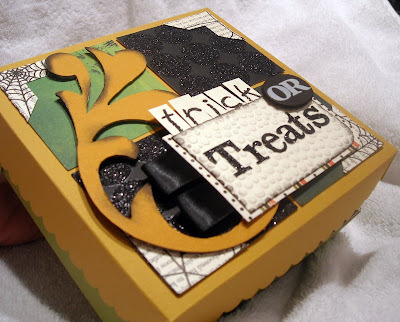 See...No pencil shavings or dust bunnies as blog candy....it's really stamping goodies! :-) This first round of goodies consists of a mini bag of sparkly brads in black, yellow, green, and purple, black prima flowers, a collection of cardstock in different sizes (mustard, lime green, purple, black, newspaper print with spider webs, and black with sparkly circles) and a ghost mini album. These supplies are part of the Odd Bird Planet A La Tarte Halloween kit. You can see the projects I created with a portion of the kit here, here, and here. Here's how you enter the blog candy drawing. Tell me what your plans are for Thanksgiving...going out, staying in, cooking a big dinner, or opting for take out? Me? We're not in close proximity to our family members to we gather with two or three other families from our church. We've been doing this for about eight years and it's a total blast! We have about 12-20 people in attendance and we eat more, spread out over an eight hour period of time, than we should! Weight Watchers here I come! LOL! You have until Wednesday night (11/26) at midnight (EST) to enter! Enjoy! This week on the SALT blog it was my turn to set the challenge. I actually came up with my topic when getting ready for the Hope challenge from a few weeks ago. When I was looking for scripture for Hope I came across a heading in my Bible that made me read further, “Comfort in Suffering.” Suffering? Doesn’t sound very appealing, does it? No one likes to suffer and yet everyone has suffered to some degree in their lives, affected by sickness, death, divorce, disappointment…the list goes on. What good thing can be gained by suffering? Salvation....Christ willingly offered Himself up to the most horrific suffering ever experienced; the brutal torture and ultimate death on the cross to pay for the sins of His people. What He experienced was the epitome of suffering. Had it not been for Christ’s willingness to suffer in our place, we would be forever bound to sin and misery and face an eternal end far worse than any suffering here on earth. The comfort of others...God can use our sufferings to be a blessing and comfort to someone else. Can someone who has never lost a loved one truly understand the grief associated with such a loss? Not entirely. But someone who has had the same experience can be of great comfort to a grieving individual since they can identify with such despair. Our final deliverance...Scripture tells us that we may be "burdened beyond measure, above strength, and despaired even of life." Our hope and comfort can not be found here on this earth but is found in the One who is able to deliver us from physical, and more importantly, spiritual death. As Paul states in II Corinthians 2, "Our hope for you (the church) is steadfast, because we know that as you are partakers of the sufferings, so also you will partake of the consolation." Suffering in this life is unavoidable but through Christ we have great reason to rejoice, in good times and bad. We can rest in knowing that God has a sovereign purpose both in our troubles and in the comfort that He gives us in them. We invite you to join with us in celebrating the comfort found in Christ by creating a card, scrapbook page, or other project based on this week's theme. Leave us a comment on the SALT blog with a link back to your blog or gallery...we'd love to see your creation!! On my layout...Oh my goodness...I digiscrapped!!! It's a painfully simple and not very fancy layout but it was a blast to create! 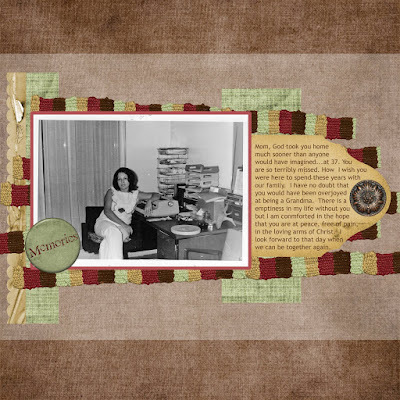 I would say that I'm hooked on digital scrapbooking...Can't wait to do more of it!! This photo is of my mom not long after my parents divorced and she had to go back to work full time. She was diagnosed with cancer about six years later and passed away at 37, I was 15 and out on my own, supporting myself, at 17. To say that her death was and is a huge loss is an understatement and over the years I've had people express their sympathies by saying how hard my life must have been. I've never looked at it that way, there are so many people who have much harder lives than mine. Looking back I can clearly see God's hand in my life, directing my path and granting me protection and friends who have been like family. If God is truly God, then He must be in control of all of the details of our lives, even when we suffer and now, as a Christian, I can confidently rest in the comfort He provides and in the hope that one day I'll be with my mom for eternity. My goodness, how could this have happened?? I forgot to share my very favorite cupcake card a few weeks ago! 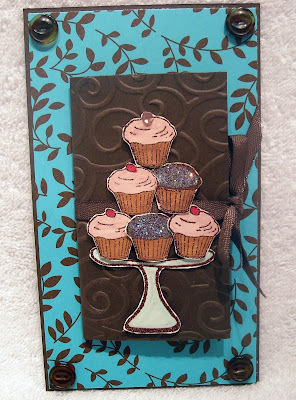 This was the last in the cupcake series and somehow this poor little card was forgotten! Isn't this fun? 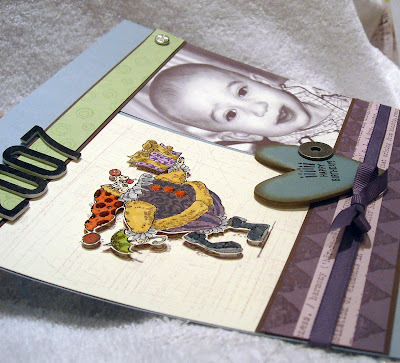 The design is from a layout I found in a CARDS magazine and I just adapted it to suit my images and paper choice. 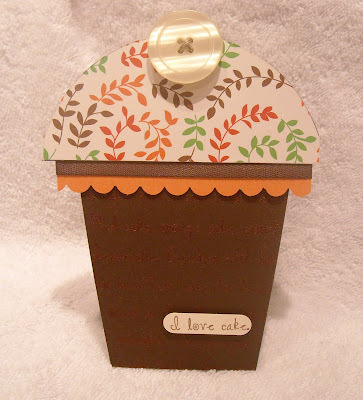 The background of the cupcake holder is embossed, which you can see better in the photo below. Wouldn't this be great as a birthday party invitation? The possibilities are endless! Paper is from Martha and the background word image is courtesy of Odd Bird Planet stamps. Enjoy your weekend and have a cupcake for me! A dear friend of mine recently had surgery on her shoulder...a "fun" surgery that will ultimately take her almost a year to recover from...She is also my faithful stamping buddy so since she is going to be out of commission for awhile, I decided to have her over for a special pre-surgery stamping night a few weeks ago where we would create something other than a card. 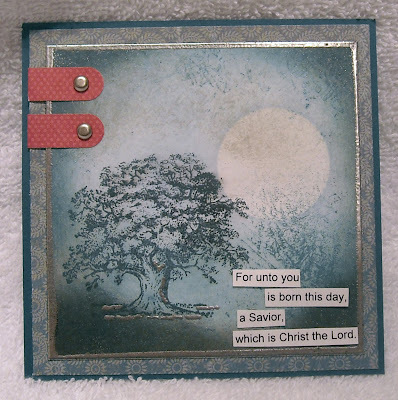 I found this great project via a link on Splitcoast Stampers. 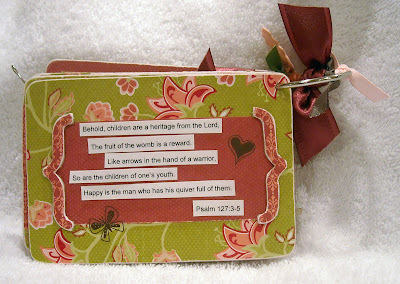 This template is from Andrea Walford's site and you can find it and the directions here. You might just want to make this cute purse yourself! And Andrea is a very talented stamper so have a look at here beautiful creations while you're there! 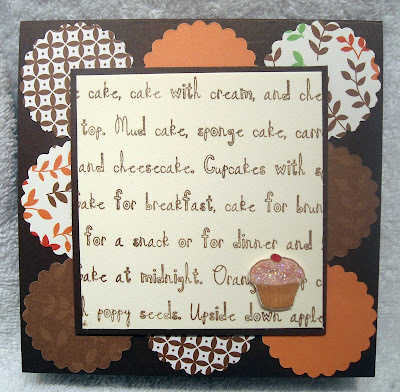 All of the supplies used in my project is from Stampin' Up! 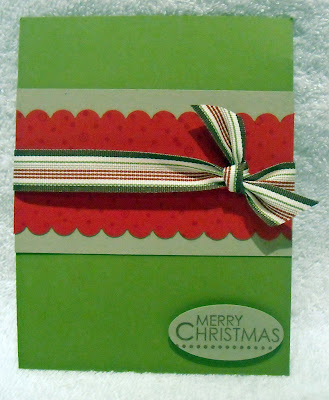 The paper, which is just beautiful, is from their newest release of holiday doubled sided paper. Love it! Enjoy and why not try this project out this week...You'll love the results! I decided to go with an Odd Bird Planet cupcake image along with the I Love Cake background stamp. Didn't alter the layout at all, really like it, will have to use it again! The tiny rhinestones at the bottom of the scalloped edge are actually from Taylor's store. Thanks Taylor for the fabulous sketch!! 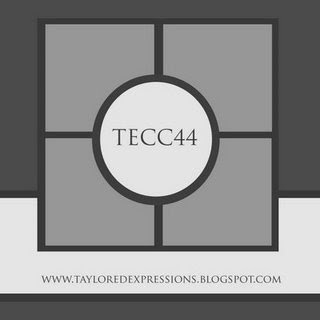 Go check out all of Taylor's adorable cupcake stamps and creations!! During the past few months the word "hope" has been bantered about in the media, by friends, family and neighbors. It seems many in our world hope for change in many things and it appears that their hope is based on a person or group of people. Is it wrong to hope that distressing times in our lives would change? Certainly not! The question is who or what is that hope based on? If our foundation of faith is in any individuals, whether that's one's spouse, a president, or employer, you will always be disappointed. No man or government will ever be able to meet the expectations of the masses seeking worldwide or personal peace or recovery from emotional, financial, or physical distress. Psalm 146 states, "Do not put your trust in princes, nor in a son of man, in whom there is no help. His spirit departs, he returns to his earth; in that very day his plans perish." If we can't ultimately trust in men to solve our deepest problems who or what can we trust in? Is there a way to have hope and even joyful expectation of relief in the midst of great suffering and uncertain times? Continuing in Psalm 146 we see the answer, "Happy is he who has the God of Jacob for his help. Whose hope is in the Lord his God. Who made heaven and earth, the sea and all that is in them; who keeps truth forever, who executes justice for the oppressed, who gives food to the hungry. The Lord gives freedom to the prisoners. The Lord opens the eyes of the blind; the Lord raises those who are bowed down. The Lord loves the righteous, the Lord watches over the strangers; He relieves the fatherless and widow." We see that ultimately it is the almighty Creator of heaven and earth that delivers real spiritual freedom, basic necessities like food, clothing, and shelter, and relief for physical ailments and the broken hearted. Government, no matter the promises made or how charismatic a leader, can't adequately meet the physical needs of the people. Nor can they bring relief to the deep spiritual needs of a nation or individual. History has proved that point again and again. Simply put, men, minus a Godly moral and ethical mindset, lack the power and ability to accomplish such an awesome task and God will simply turn their efforts "upside down." This week at SALT, Hazel challenged the team with "Hope." The timing of her challenge is perfect, her write up inspiring and touching. Please visit the SALT blog to see all of the lovely creations made by our design team. We would love to hear from you and see what you create based upon the theme. Please leave us a comment and link back to your blog or gallery. We can have great hope, even in troubling times. Romans says, "...we glory in tribulations, knowing that tribulation produces perseverance, and perseverance character, and character hope. Now hope does not disappoint because the love of God has been poured out in our hearts by the Holy Spirit who was given to us." One will never be disappointed if one's hope is fully centered upon Christ. "The Lord shall reign forever!" Sorry I missed my "cake" post yesterday, came down with a cold and just felt lousy so I spent the majority of the day just relaxing. Feeling a bit better today and am ready to get back to the business of sugary delights! First it was cake, now it's cupcakes...just a mini version of a cake! I adore the Odd Bird Planet cupcake stamps! This little one, pictured above, is from a image that contains a row of cupcakes. For this card I cut out one to mount on top of my "I love cake" declaration! Background papers are all from the same Martha Stewart paper pack. Enjoy! Another installment in the "I love cake" creations! This card features the same Odd Bird Planet images as yesterday's post. 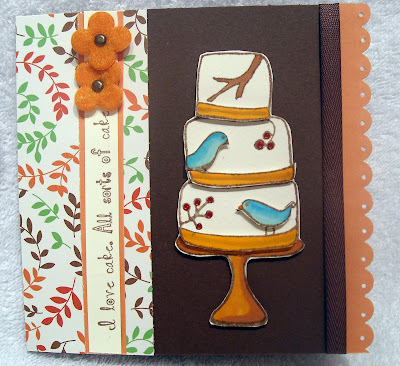 On this card I paper pieced the two birds and ribbons around the cake so that they pop up off the cake. Tiny red crystals have been added to the end of the branches and the fact that you can't really see that makes me realize I really need to take better photos! 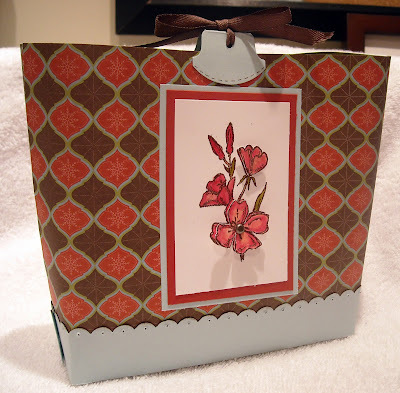 :-) The patterned paper is from the same pack of Martha Stewart paper and the cute felt flowers are from Stampin' Up! Tomorrow it's onto cupcakes! I'm not kidding, I really do...as evidenced by my expanding backside! LOL! Egad! It's time to head back to Weight Watchers and the gym! I love being a SAHM but it sure doesn't bode well for my eating habits. ;-) However, cake stamps are completely fat free with zero calories...what's not to love! Over the next few days I'll be sharing a few cake/cupcake cards created with the same Odd Bird Planet stamps and coordinating papers. 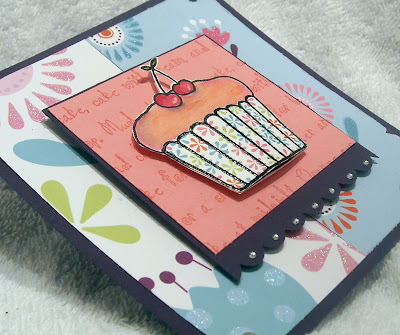 The OBP cupcake and card images are some of my favorites and the one I used on the above card was part of my very first purchase. I love the versatility of this cake as you could use it for a wedding card, birthday card, or an I love cake card, as I did! **smile** The image was embossed with brown powder and colored with Copics and the background paper is from Martha Stewart. 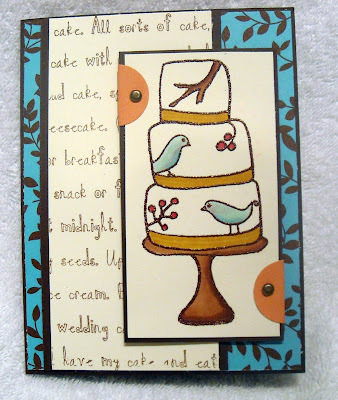 Both of the images on the card; the cake and the "I love cake" background stamp are both from OBP. Enjoy and go eat some cake! "Why should cross and trial grieve me? Christ is near ,with His cheer, never will He leave me. Who can rob me of the heaven, That God's Son, for my own, to my faith hath given? God oft gives me days of gladness; shall I grieve, if He give, seasons too of sadness? God is good and tempers ever, all my ill, and He will wholly leave me never." I pray that today you may be compelled to lift up your voice in thanksgiving and praise, with a heart overflowing with gratefulness, for how God has blessed your life! Please visit the SALT blog to see all of the beautiful creations made by our talented design team! That it's been a long time since I've posted! Holy cow, where did a whole week go?! Seems like life just keeps getting busier and busier...I really need to find a way to live on only two hours of sleep so I can get more done each day! LOL! A quick and easy card to share today, utilizing Odd Bird Planet images. This is a 4" x 4" notecard. The peach patterened paper is from a Maaartha Stewart collection. Happy Monday! 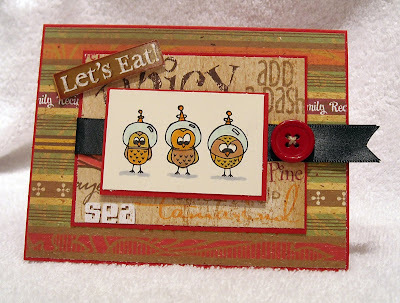 One more card using the Flair "Keep on Cooking" paper along with Odd Bird Planet stamps. 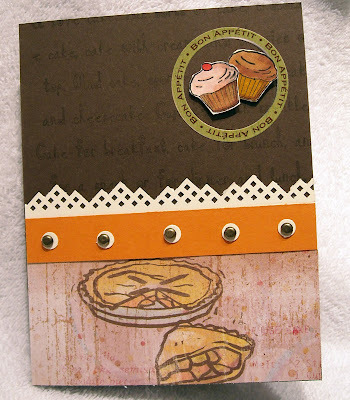 This card showcases two of the cupcakes from the OBP "cupcake row" image (there are a total of four cupcake images on one stamp). Each has been colored with Copics, cut out and adhered with dimensional tape inside the Bon Appetit circle sticker, which coordinates with the "Keep on Cooking" Flair paper. 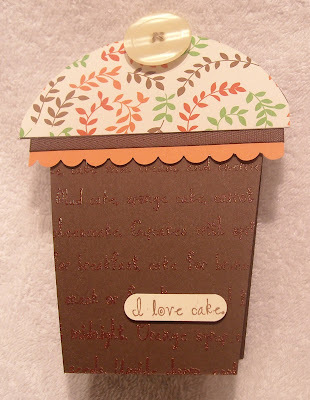 And you can just make out the "I love cake" background stamped, which was stamped with a VersaMark pad on the brown background. It came out a little too light, embossing the words probably would have been a better idea! I also tried a new design element on this card. Attaching the brad to the center of a tiny piece of punched paper. I like it...like a little border for the brad! Enjoy and eat a cupcake today! PS - In my last post I referenced a web site where I purchased the pocket card, which was part of a larger kit. Not sure if that specific kit is still available but I found the link to the site, which is Lisa Bearnson's (Kit of the Month). She has great stuff, you should definitely check it out! Tomorrow is World Making Card Day!! And Odd Bird Planet will be paricipating in a big way! 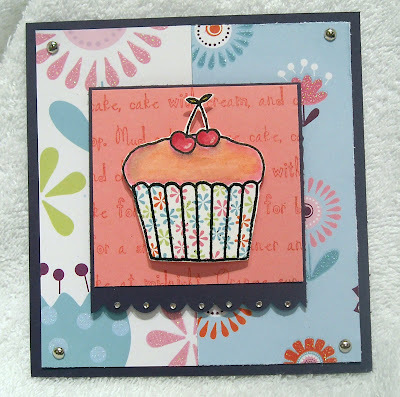 ODP DT members will be posting challenges and samples on their blogs and will also be listing them at our Forum and on our Spiltcoast Stampers Forum. There are some awesome prizes, so you should most diefnitely participate. Winning freebies is always such fun and it's a win-win situation since you'll be creating gorgeous cards that will be sure to challenge you! 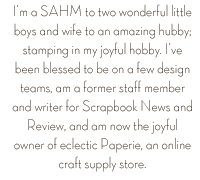 The OBP DT members' blogs are listed along the right side of my blog and some of them are giving sneak peeks and others, like Mandy, who owns Limelight Paper Crafts is having other great challenges and prizes. She's also running a Design Team search, so you should check that out as well. Challenges will be posted all day Saturday, starting at 6 a.m. PDT and will run until Midnight. You'll have until Sunday to complete the challenges, and winners will be posted early next week. Good luck and have fun with all the great challenges. I can't wait to see what you all do! Another project created with the Odd Bird Planet A La Tarte kit. This one is a photo holder created from a large wooden spool. The spool has been covered with paper from the kit and the top has been covered with a beautiful fine black glitter that also comes in the kit. Wish I knew how to photograph glitter so that you could see the sparkle! (I sponged black ink on the bottom of the spool to cover the wood.) 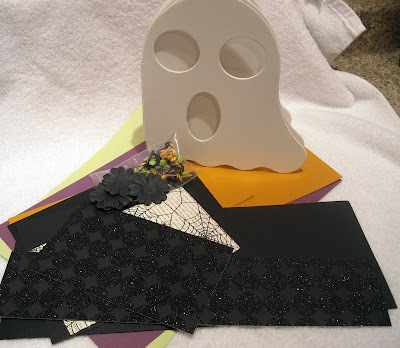 The letters for "boo" are also from the kit, as well as the bat gate stamp that was used to support my dancing skeleton, who was cut out of one of the decorative paper included in the kit. Since we don't do anything about Halloween, I didn't have a fun "kid dressed up in a costume" photos but this one of my oldest kind of looks like he's saying "boo" doesn't' it! I actually think he was playing peek-a-boo at the time...Fun!! Enjoy and get on over to OBP to pick up your kit before they're all gone!! Another creation using the Lime Tart A La Tarte halloween Kit, available over at Odd Bird Planet. 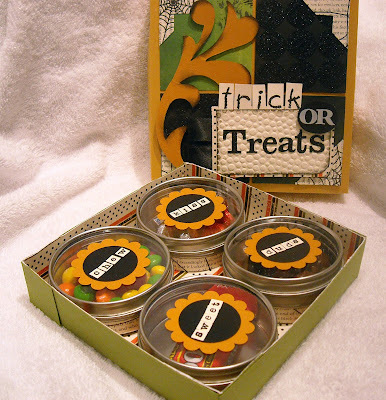 For this project I used the cardstock from the kit to line the inside of my treat box, as well as for the decorations on the cover of the box. The letters that spell "treats" are also from the kit. Favorites from this kit? I love the striped paper (inside of the box)! The other side is a newspaper print with a web design all over it (you can see a tiny bit on the corners of the box top). I also adore the black polka dot glitter paper, also seen on the front of the box. High quality paper, heavy weight, and great designs - love the papers! Such great projects that can be used for any kind of Fall project!! We don't "do" halloween in our house so I enjoyed making a box to hold candy for the kids...or the hungry stamping mom...we'll see how gets to them first! ;-) (The tins inside the box are from Papertryink). Head on over to OBP and grab one or two of these kits before they're sold out - supplies are limited! !